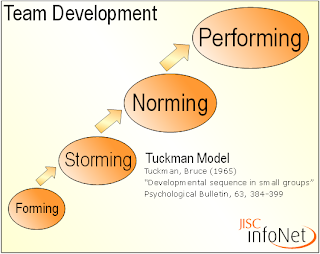 The Forming – Storming – Norming – Performing model of team development was first proposed by Bruce Tuckman in 1965, who maintained that these phases are all necessary and inevitable in order for the team to grow, to face up to challenges, to tackle problems, to find solutions, to plan work, and to deliver results. This model has become the basis for subsequent models of team dynamics and frequently used management theory to describe the behavior of existing teams. It has also taken a firm hold in the field of experiential learning and outdoor education where team building and leadership development are key goals. 1. Forming: The group comes together and gets to initially know one other and form as a group. 4. Performing: The group practices its craft and becomes effective in meeting its objectives. 5. Adjourning: The process of "unforming" the group, that is, letting go of the group structure and moving on.